After four years of battlefields soaked with blood, and fields quivering from the sound of a billion battlecries, we’re celebrating Chivalry’s birthday with a Halloween twist in this free Trick ‘n Treat Bag. TRICK: Dazzle your opponents with a Mirage! 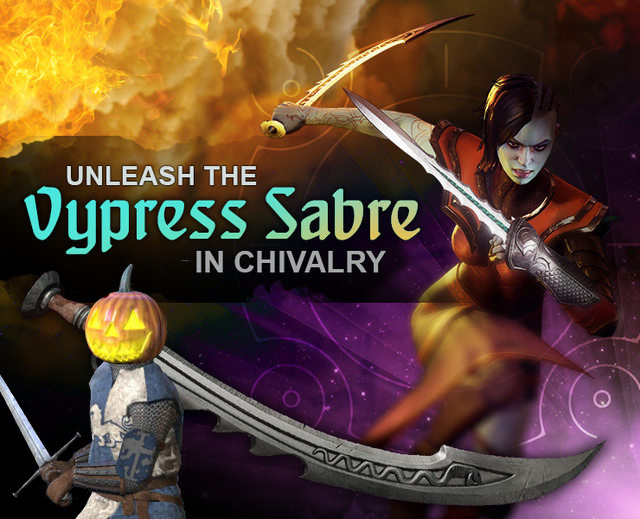 Unleash the Vypress Sabre, a weapon from our upcoming magic & melee game Mirage: Arcane Warfare. Join the Mirage Steam Community to unlock. TREAT: Don the delicious Pumpkin Spiced Helm in Chivalry for a limited time. Both items can be found in the Customization menu, for free. This weekend only, get up to 60% off weapons and armor from the Chivalry Workshop. Sign up for the ongoing Mirage Closed Alpha today at MirageArcaneWarfare.com. They probably would if they could :/ but thanks to activision they don’t have access. @Zer0x593 Activisions not stopping Torn Banner from just making Chivalry 2. If they would only see the $ they could make with a 2nd Chivalry. launch any medieval sequel with so many competitors about. Timing is everything with a games release. even if only until a Chivalry II is on the horizon because many players would drop all to come back to that. @Wilt That’s what torn banner gets for not striking while the iron was hot. Mirage will not be successful enough for torn banner to make it big the way they wanted. They should have put all their time and money and in Chivs when they had the chance. Truth be told Chivs can still make it big but torn banner is to blind to see it apparently. @SDS-NewAgeKnight TB should hire you as their Director Of Strategy because you obviously hold a great deal of commercial experience and are not biased whatsoever as to what they should be doing with their resources. What an AWESOME weekend! Thanks for the sale gents! That was and still is a BLAST with all the fresh meat! Thank you kindly! Working on keeping as many of these new players as I can. Thanks for the opportunity! Tastes DAMN good to me still though.